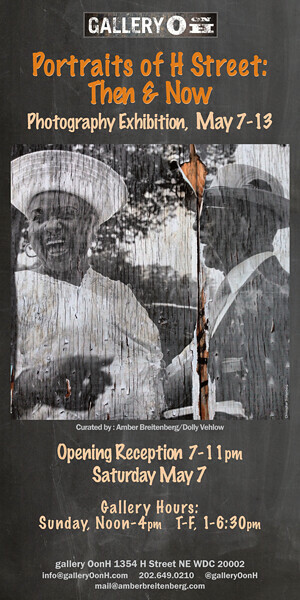 Gallery O on H (1354 H Street) has a new photography exhibit Portraits of H Street: Then & Now opening this Saturday. The exhibit highlight's the H Street Corridor's rich history as captured by photographers over the years. The exhibit will also be open to the public on Sunday from 12pm-4pm, and Tuesday-Friday 1pm-6:30pm. I am curious to know if they are going to have the FULL history of H street - including the immigrants that built this great neighborhood - or the same old select history about the groups that destroyed it. @11:16, I would assume that it includes a full history but may also depend on who took initiative to submit photos. It will be interesting to see what photos are in the exhibit and what we all remember from history of H Street. I hope residents looked far back in their photo archives to make this exhibit complete.